Is it possible to report honestly on troubling developments in the arts without becoming a prophet of doom? I’ve found myself wondering about this in the past week or so, as I prepared to say a few words on a panel with the title: “The Decline of the Arts?” Having published more than my fair share of takedowns of various artists and art world institutions, I was in no doubt as to why I’d been invited to participate. And yet I felt more than a little uncomfortable about being associated with the word decline. Of course decline can be a fairly straightforward descriptive term—in the sense that we say that a person who is old and ill and will probably never entirely recover is “declining.” But to speak of “The Decline of the Arts” is to suggest a development with a philosophical or ideological amplitude, to evoke thoughts about the rise and fall of civilizations and cultures, about periodicity, systemic failure, decadence, maybe even the divine retribution that is sometimes woven into arguments about the collapse of civilizations. I find myself thinking of Oswald Spengler’s The Decline of the West, a book I remember from my parents’ shelves when I was growing up; the volume’s dusty, beat-up covers made its darkly apocalyptic vision seem all the more terrifying. My problem with theories of decline is that they suggest historical inevitability—and are therefore an affront to liberal experience. In his great essay, “Historical Inevitability,” Isaiah Berlin worried about a belief in “the occult presence of vast impersonal entities … which we have but little power to control or deflect.” I think that any serious discussion of the decline of the arts risks this kind of impersonality, in that it denies—or at least seriously endangers—the individual’s ability to change the situation. The arts, which are so inextricably involved with the possibilities of the individual intelligence and the individual imagination, are certainly one of the clearest demonstrations we have of the folly of historical determinism. And it is the critic’s duty, no matter how overwhelmingly bad the news may be, to refuse to reduce art to a deterministic pattern. So although I believe that the visual arts are in anything but the best of health, I would not want to speak of a decline. Decline is a principle—an inevitability. And what I see when I go to the galleries in New York, as I did the other day, although there is plenty of bad news, is not anything I would regard as the demonstration of a principle. There happens to be an enormously disturbing exhibition at Sperone Westwater on the Bowery right now; it’s called “Marble Sculpture from 350 B.C. 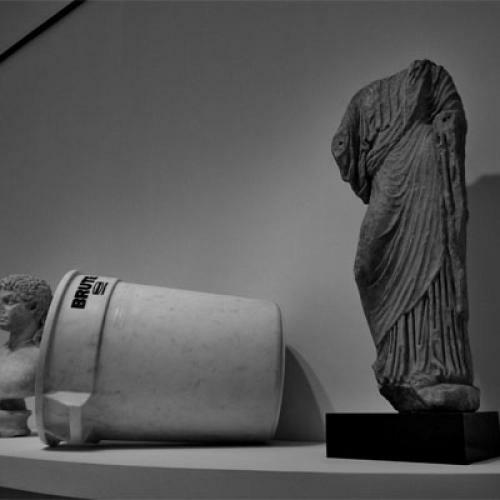 to Last Week.” Here an ancient Roman portrait bust is exhibited right next to a marble replica of a Rubbermaid garbage can by Tom Sachs. This is a perfect illustration of what I call laissez-faire aesthetics. At Sperone Westwater the most vapid kitsch taste has been wrapped in a high-chic package. I hate it. But is it a sign of decline? No, at least not as long as there are many people who see things differently and do things differently. To speak of decline is to insist on a particular pattern. Of course patterns have their appeal. There can be something enormously comforting, almost cathartic, about the sense of decline. If things are this bad—if we are indeed witnessing the decline of the visual arts—then we may feel that we are freed of all responsibility. But the critic who declares the end of art is as detached from the realities of art as the critic who claims that all is well in the world. Both have rejected the close study of reality that Berlin insists upon in his essay on “Historical Inevitability.” The evolution of an art form is far too mysterious, too much a product of the unpredictable movements of many particular imaginations, to ever fit into some preordained pattern. Decline—and perhaps this is the most troubling thing of all—involves a prediction about the shape of the future. To speak of decline is to flirt with the kind of dystopian hyperbole that feeds the authoritarian imagination.